The reformist opposition in Iran is still dedicated and vowed to continue their fight against what they claim are fraudulent election results. In the meantime the demonstrations have for the most part abated and the streets of Tehran are back to a kind of normalcy again. Some leaders of European governments have submitted their protests to the Iranian theocratic rulers about how they chose to deal with demonstrators in the last couple of days. Yesterday the president of the United States expressed his criticism saying he was appalled and outraged about the post-election crackdown. This interference in their internal affairs seemed to have angered Iranian leadership who accuse mainly the US and UK in being supportive of violence in the streets of Tehran. After expelling two British diplomats from Iran the UK did the same with their Iranian colleagues in London. The US joined this diplomatic row and withdrew invitations to Iranian diplomats to attend US Independence Day celebrations on July 4. This is reminiscent of the Bush-neoconservative era of exclusive axis-of-evil type of policy rather than change under which premise Obama run and successfully won the White House in the November election. Obviously Obama is becoming choosy again and does not want to sit down with just anybody anymore. If a covert attempt to regime change in Iran is his only answer to the problems in the Middle East than yes we can and change is possible more and more resemble empty phrases. The unvitation is clearly a step backwards in the crucial relationship between these two countries. It was the first time since Washington cut diplomatic ties with Tehran in 1980 that Iranian diplomats had been invited to the embassy parties, but the move to withdraw the invites was largely symbolic as no Iranians had even responded. "The president’s policy of engagement is obviously delayed, but we are going to have to deal with the government of Iran," Senator John Kerry, chairman of the influential Senate Foreign Relations Committee, told Reuters. The best U.S. option for pressuring Iran, the world’s fifth biggest oil producer, was to drive down crude prices by reducing America’s dependence on imported energy, Kerry said. Mohammad Marandi, who is the head of North American Studies at Tehran University, said mistrust of the United States and Britain was rife, partly due to the "very negative" role of U.S.- and British-funded Persian-language television stations. "They are working 24 hours a day spreading rumours and trying to turn people against each other," he told Reuters. "In the short term relations will definitely get worse, but in the long term the U.S. really has to re-think its policy and to recognize that regime change is not possible in Iran." Mr. Friedman is a distinguished book author and columnist for the Times, one of our foremost experts on globalization and all things political for that matter, and yet he does not seem to understand the political situation in the Middle East. His article ‘Bullets and Barrels’ about the recent developments in Iran is confusing to say the least. At first he concedes that past elections were legitimate but then concludes that this time the regime panicked and stole the election. His analysis is entirely based on the speculative assumption that Mousavi supporters are the majority in the nation of Iran. I can only speculate about his motives and as to how he reaches this conclusion but he seemed to completely ignore Ahmadinejad’s popularity. In this election Ahmadinejad was widely believed to have run a more successful campaign than his challengers, he was seen by many as the more popular candidate during the televised debates. While many in the west rush to judgment about Ahmadinejad they never really challenged Khamenei and the Iranian Revolution. I assume because of overwhelming support of the system among the Iranian populace. Ahmadinejad is their candidate of choice. As George Friedman points out, the question is not why Ahmadinejad won, but why so many thought he would not win. The writers own analysis that this election was a referendum against the regime is counter to anything we know about Iran at this point. I have not found any reasonable argument in his article that would support this thesis. Like many he seems to be entirely captivated by the flow of information out of Iran that is coming from new technologies, but surely a revolution against the Iranian Revolution will not be achieved by Twitter and social networks. Friedman also does not distinguish between reform and moderation as core-motives in this election. Reform that challenges the theocratic system of rule in Iran would be hugely chaotic and ultimately negative for the Middle East. He confuses motives of occidental governments with the needs and desires of their oriental counterparts. As long as we do not approach the Middle East with a genuine desire for peace any attempt to bring about change will fail. Iran – has the West already won? “Some may imagine that street action will create political leverage against the system and force the authorities to give in to threats. No, this is wrong,” he said. This explicit statement regarding the system of government gives a hint about the real struggle that must be going on behind closed doors among the theocratic elite in Iran. At stake is not only an allegedly rigged election but rather the existence of the Iranian Revolution itself. Whether the protesters themselves led by Mousavi and Rafsanjani are aware of this daunting challenge is not clear. But what should be clear among those taking to the streets is that this revolution against the revolution will not be accomplished by Twitter and social networks alone. As supreme leader Khamenei reiterated those responsible for blood, violence and chaos have to take responsibility. There have been many accusations, during Khamenei’s prayer and before, of western governments trying to meddle with Iranian internal affairs (also here). Whether US., Great Britain and what he called Iran’s other enemies try to force a showdown over Iran’s non-elected theocracy and shake up the foundation of its system of rule is uncertain although possible given the general uninhibited elation in western media over the street protests. I hope all those concerned know what they are doing and are willing to accept responsibility. The next days and weeks will define this struggle and although the outcome is uncertain, Iranian leadership must not ignore it. The hundreds of thousands of people taking to the streets have already shaken the foundation of the Islamic Revolution. If the theocratic leadership remains stubborn and does not recognize since the overthrow of the Shah a generation’s life has passed, they are poised to meet the same faith. We should care more about seeking the truth than give in to passion in the heat of the moment. While ‘Tweeting’ has its merits and is certainly a lot of fun it is not in any way a true representation of the actual situation in Iran. Many Iranians mainly in rural areas do not have access to this form of communication and we must not make the mistake to ignore them. Iran is still a very remote nation for most of us and is therefore important to be informed as comprehensively as possible to make a fair judgment of the situation in Iran. We have heard many accusations of voter fraud from Mousavi himself and his followers, but also from many outside of Iran. What these accusations have in common is that they are not based on rational arguments but rather a preconceived sentiment towards Iranian politics. We want to free Iran from its theocratic rule and mold it according to our western democratic society. This arrogance is the reason why we rush to judgment and overwhelmingly condemn the election as fraud. We do not need proof because an anti-liberal like Ahmadinejad must not be legitimately elected. We can also not ignore that our own political elite has a vested interest in regime change in Iran because of a nuclear stand-off that threatens their own ideas of security. Georg Friedman is founder of STRATFOR Global Intelligence and in ‘Western Misconceptions Meet Iranian Reality’ he presents us with a different analysis. A mass movement of people in Iran towards liberalization is a myth. Iranians are for the most part still supporting their revolution that started about 30 years ago. Friedman calls the pseudo-revolt based on Twitter ‘I-pod liberalism’, something that does not represent the Iranian populace. Many of those who actually want regime change speak English but this I-pod owning Anglophones are not exactly the majority in Iran. Mousavi supporters base their claim of wide-spread fraud on polls that have been conducted shortly before the election. These polls show a head to head race between the contestants, some even saw Mousavi ahead. To those Ahmadinejad’s overwhelming victory was stunning. Iran is a vast country and polling is notoriously difficult when phones are not universal and once you have a phone it is not sure that you can make a call. Most people in Tehran have a phone and a majority most likely voted for Mousavi but people outside of Tehran that could not be reached with a phone were not included. These polls were therefore misleading and do not in anyway support Mousavi’s claim. Friedman challenges the common perception that Ahmadinejad has total control over the vote counting. he seems to say like it or not but the process is democratic. Their is sufficient oversight and Ahmadinejad has powerful enemies who would not hesitate to use any irregularities against him. He certainly knew that he would be called on any irregularities, like in any other democracy, and risk a revolt. Moreover these accusations totally miss the point of Ahmadinejad’s popularity. The president of Iran is popular because he speaks to most important issues of piety, corruption and national security. For most Iranians and for those outside the professional elite in Tehran, which are the overwhelming majority, he is the candidate of choice when it comes to these issues. During one of the election debates Ahmadinejad challenged Mousavi’s connection to Rafsanchani’s sons, who are widely believed corrupt figures, and this resonated well among Iranians who strongly support a candidate fighting corruption. Similarly the claim that reformist supporters of his challenger, like former president Kathami, had been willing to suspend the uranium-enrichment program tapped into popular support for the program. A major point in the fraud accusation is an alleged underrepresentation of the Mousavi vote in Iran’s Azeri-majority provinces. Mousavi is Azeri and therefore should have won the popular vote. This completely ignores the fact that Ahmadinejad served as an official for eight years in two Azeri provinces. He also speaks perfectly Azeri and artfully quoted from Azeri poetry during the campaign. The assumption that Mousavi was somehow assured of the Azeri vote is simply not grounded in reality according to the Politico. Not all polls are designed to be equal. One that was conducted by the Washington based organization Terror-Free-Tomorrow before the debates assigned a twenty point lead to the incumbent over his challenger. Moreover Ahmadinejad was perceived to have done well during the debates while his challenger did poorly. In Friedman’s own words: ‘That he won is not the mystery; the mystery is why others thought he wouldn’t win’. On Friday the middle eastern nation of Iran held presidential elections. The European Union blushes by the sheer record turnout of electorate. In this election 85% of 46.2 million Iranians eligible to vote went to the polls. The incumbent Mahmoud Ahmadinejad, a well known hardliner and religious conservative opposing the US and Europe on the fundamental issue of use of nuclear technology, was widely expected to be in a head to head race with his challengers. Most promising was Mir-Hussein Mousavi, who was the last prime minister of Iran before this post was abolished during the course of the Islamic Revolution and the establishment of theocratic rule of Grand Ayatollah Khomeini. Mousavi managed to win over Iranian youth in an aspiring campaign that used modern technology like internet and cell phones very much like the Obama campaign in the US. Different polls during the campaign promised a close race between these two contenders. It was therefore surprising to learn in a somewhat hastily managed announcement late Friday night, that the incumbent has won with a wide margin. The official results as declared by the Interior Ministry see Ahmadinejad with 62 percent of the vote and Mousavi with only 33 percent. In a first reaction the challenger claimed the elections a fraud late Friday night The only official statement coming out of Mousavi’s camp so far is a letter where he strongly protests ‘the many obvious violations’ and warned that he would ‘not surrender to this dangerous charade’. In the meantime the supreme religious leader of Iran Khomeini has declared his support for Ahmadinejad and therefore sealed the election. The obvious rush to declare the incumbent winner is of course strange and gives rise to many speculations. A close time-line of events late Friday night might shed some light on this issue. Al Jazeera takes a closer look at the hours between the final closing of the vote and the announcement of initial results. Just when word from a first statement of the challenger made the round among journalists gathering at the Interior Ministry, Kamran Daneshjou, the election chief, was supposed to make an announcement at 11pm Iranian time late Friday night. Instead of the announcement rumor of a new lead story by Islamic Republic News Agency (IRNA), the official government paper, made the round. The claim, Ahmadinejad has won strong support in the countryside, lifted the spirits of the pro-Government camp. At about the same time Mousavi released a statement in which he claimed outright victory. Moments later, at 11.50pm [19:20 GMT], Daneshjou appeared. He claimed that about 5 million votes had been counted so far and 69 percent showed Ahmadinejad and less than 30 percent Mousavi as their favorite. After the Interior Ministry quickly rejected the challenger’s claim, Daneshjou appeared before the press again with an update at 12.20am. Now 8000 more ballot boxes had been counted and the president was still leading with almost 69 percent of the votes. There was some confusion whether these were new counts or recounts. After this each update count kept Ahmadinejad in a solid lead and after 3am in the morning the Interior Ministry went quiet for the night. The next morning the old and new president was declared victorious. Disappointed by the results and strong claims of obvious fraud during counting of the votes, Iranian youths took to the streets and violence erupted. About 2000 Mousavi supporters erected barricades in Tehran and clashed with baton wielding police. By Sunday everything seemed to be quiet again, but allegedly three protestors had been killed in some of the most serious unrest Tehran has seen in years. This certainly does not prove that the elections were outright fraudulent but the counting and the hasty announcement leave room for speculation. In addition it became known that Mousavi’s newspaper, Green Word, did not appear on newsstands Sunday after the paper’s web site reported that about 10 million votes were without identification number and therefore ‘untraceable’. Of course Mousavi’s statement declaring victory before the announcement of official results might have spurred this race to finish the vote count and therefore unintentionally contributed to street violence. With all the uncertainties there exists no written complain about voter fraud so far said Iranian Interior Minister Sadeq Mahsouli. Whatever happens in the coming days the level of violence and preparedness among young Iranians is a game changer for the hard line theocrats. Maybe these events will mark the seeds of a new era for Iran and its relationship with the west. 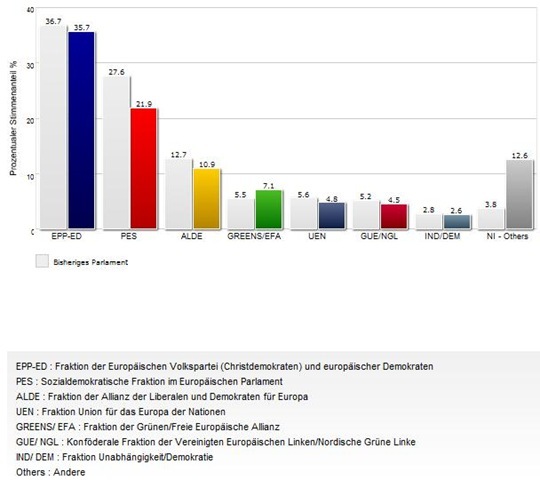 The European Union parliamentary election is over and fraction ‘Others’ is the clear winner. This should cause great concern for those who care about the significance of the EU as a political system, because within this fraction are some of the most EU-critical voices in the Union. While most of the debate focuses on results at the national level the outcome clearly weakens the European project. From 375 million potential voters in 27 EU-states only 43,2 percent went to the polls. This is a new record low. In 2004 45.5 percent cast their vote. For the first time the participation rate dropped below 50 percent in the 1999 election. Then the number of EU member states was limited to 15. Hope that concerted efforts by the EU to combat the financial and economic crisis would end up in stronger support did not materialize. On a positive note the Irish anti-treaty group Libertas of Mr. Ganley did not get significant support and failed to gain a seat. The businessman already conceded defeat and will step down from politics. I think it is premature to conclude that this will increase the chances of a positive outcome for the Lisbon Treaty. All in all this election was disappointing. The European project stalls and is clearly in need of a new direction to move forward. In the middle of the biggest economic crisis since the Great Depression the European Union asks its citizenry to cast their votes for the new European parliament . Yes five years have already past since the last election. 375 million voters in 27 EU-States will determine the constitution of the next parliament. The UK and the Netherlands are the first to vote. The vote will be particular explosive in the UK, where a political scandal around the Labor Party and Chancellor Brown has crippled the government. We will know first results on Sunday, after all polling stations are closed. Remarkably Netherland has announced that it will publish results tonight. Does not sound very democratic to me. Advanced voters in Sweden and Finland give hope for optimism that Europeans will not completely ignore the election. Advanced voters increased by about 1 percent compared to five years ago. 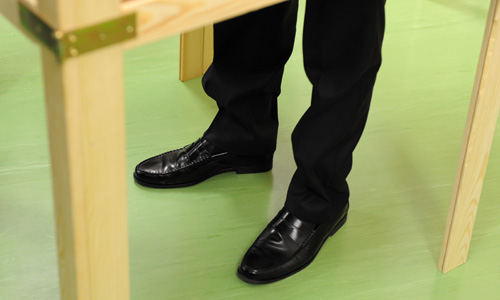 The latest opinion polls suggest about 49 percent of Europeans intend to vote.